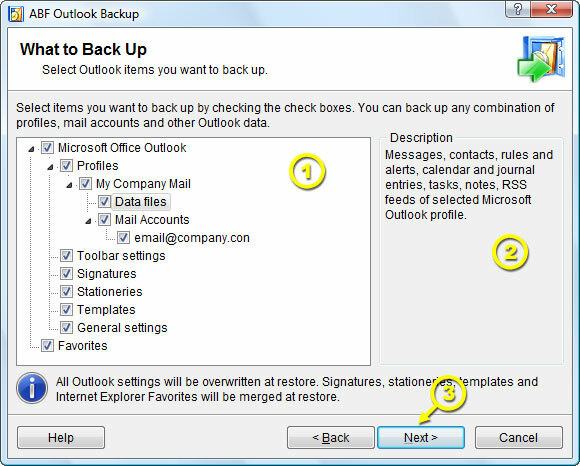 On this step ABF Outlook Backup offers you to select which Outlook items to back up. All the items you would like to back up will be stored in a single backup file. Each item within the backup file may be restored separately. Figure 7. What to back up. Check the check-boxes of those Outlook items you would like to back up. (Figure 7. Pos 1). You may need a Description (Figure 7. Pos 2.) to discover what the proper item means. Click Next (Figure 7; Pos 3) to proceed to the next step. Note: Messages, contacts, calendar, journal, notes, tasks, subscribed RSS feeds, message rules and alerts, custom forms are located under Data files. Warning! Toolbar settings and General settings are common for all Outlook profiles and will be overwritten at restore no matter which profile you are restoring. Signatures, Stationery and Templates will be merged at restore.